My entry in the JayIsGames Casual Game Design Competition #7. It was in a three-way tie for second place. The theme of the competition was escape, and the requirement was a short, single-room game. I took both the theme and the requirement in my own direction, of course; but my entry satisfies both of them. 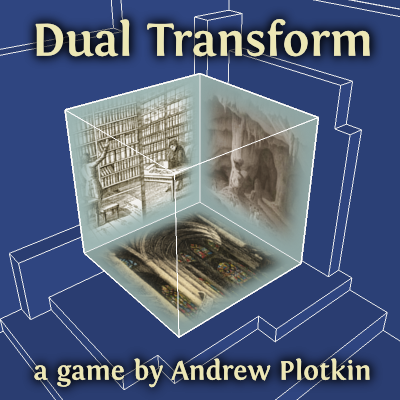 Dual Transform is copyright 2010 by Andrew Plotkin (erkyrath@eblong.com). It may be distributed for free, but not sold or included in any for-profit collection without written permission from the author.